The remains of a protest camp outside the Philadelphia ICE headquarters after it was raided by police on Thursday, which left the sidewalk at eighth and Cherry streets covered with broken chairs, umbrellas, sunblock and the food and water supply. Eventually a few protesters were allowed back into the area to collect items that could be salvaged, July 5, 2018. 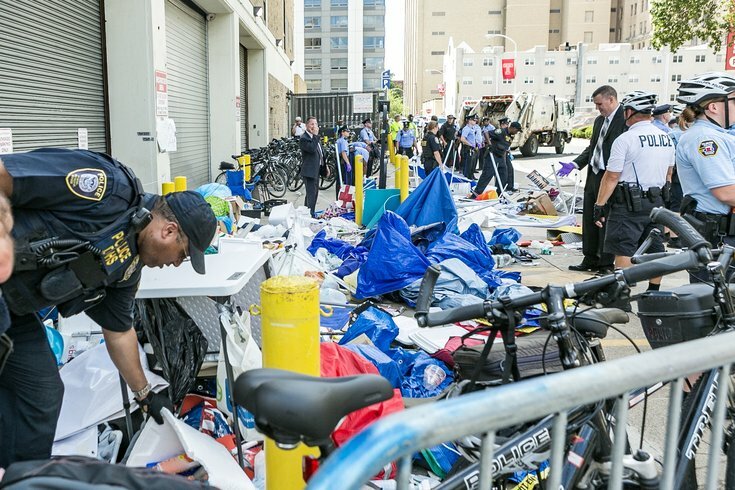 Philadelphia Police raided the Occupy ICE PHL camp and arrested seven protestors on its fourth day in front of the Immigration and Customs Enforcement office in Center City. Activists calling for the abolition of ICE have been occupying immigration and detention facilities across the country — and Philly's camp is just the latest to be shut down by police. Thursday's arrests come just two days after 29 people were arrested at the encampment and issued "failure to disperse" citations before they were released. Around 1 p.m. on Thursday, police destroyed the encampment by pushing through barricades and tents with their bikes. In a Facebook Live post from the Philly Socialists group, which helped organize the encampment, you can see police tearing down tents, knocking over food tables, arresting one protestor and eventually pushing protestors onto 8th Street near the ICE office. "Everybody move back," officers yelled as they pushed through the camp with their bikes. Indigo James, 26, of West Philly, was one of seven protestors to be arrested during Thursday's raid. Police said "protestors were present and blocking the entrance to the ICE HQ building, while refusing to allow anyone to enter or exit." All seven were given "failure to disperse" citations and released from police custody, according to police. James said she noticed police presence had picked up Thursday afternoon. And at one point, James said officers circled the block and then returned to the camp in one large group. "It was at that point that people were becoming very nervous," she said. Protesters rally outside the Philadelphia ICE headquarters on 8th and Cherry streets after the Occupy ICE PHL camps were raided and destroyed in Philadelphia, Thursday, July 5, 2018. 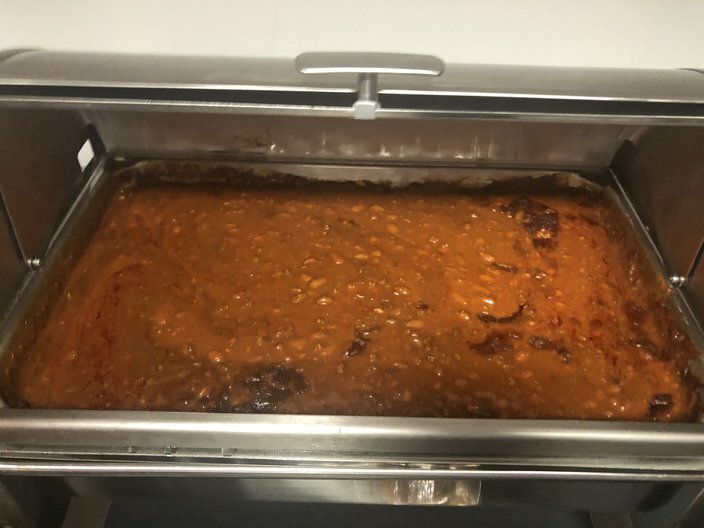 A dispute over keeping the sidewalk clear of water coolers eventually triggered officers to target the largest area of the camp holding resources like food, medical equipment and water, James said. She rushed to the resource tent to try and salvage supplies and was met by police, who then put her on the ground and zip tied her hands. During the Philly Socialists' Facebook Live video, protestors can be seen moving water jugs off the sidewalk after police ask for an entire portion of the sidewalk near the ICE facility to be cleared, citing the health and safety of pedestrians trying to access it. The raid begins around the 3:52 mark in the video. After the camp was destroyed and blocked off by police, protestors held a press conference calling for Mayor Kenney to condemn the actions of police. They also called for Kenney to demand Governor Tom Wolf shut down Berks County Residential Center and end ICE's access to the city's Preliminary Arraignment Reporting System, or PARS. "Mayor Kenney publicly celebrated the recent court victory against the Trump administration with a dance," a statement from the Philly Socialists read. "It’s time to do more than dance, Kenney. Philadelphia bills itself as a Sanctuary City, yet the city has done little to stop ICE’s abusive and destructive presence." The press conference was staged with speakers and representatives from 215 People's Alliance, Party for Socialism and Liberation, VietLead, POWER, Tabernacle United Church / New Sanctuary Movement, the Workers World Party, Philly REAL Justice, Socialist Alternative, New Sanctuary Movement and Juntos. 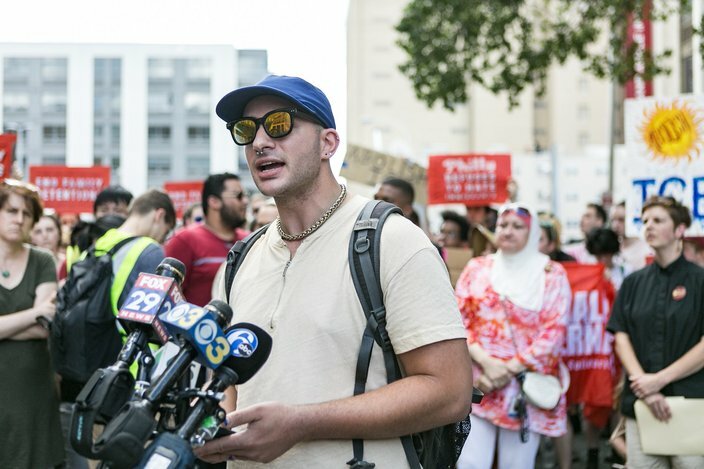 Enav Emmanuel of the group Philly Socialists spoke at a press conference Thursday, where he claimed that despite Philadelphia Mayor Kenney making a personal brand for himself opposing President Trump, he was responsible for the unannounced police raids on the protest camp outside the Philadelphia ICE headquarters, July 5, 2018. "We are in a very historical moment where the lines of morality have been drawn very clearly," Rev. Nicolas O’Rourke with POWER said. "Other times in history things have been confusing. But today ... it's very clear what is right and what is wrong."